(Nanowerk News) Motion control and nano precision positioning systems leader PI (Physik Instrumente) released a new comprehensive catalog of linear and rotary positioning systems engineered and manufactured for industrial precision automation. The products covered in the catalog address industries such as semiconductor production/inspection, laser material processing, automated optical inspection (AOI), and precision opto-mechanical alignment and assembly. PI’s in-house designed and manufactured PIMag linear motor stages and PIglide air bearing technologies and high performance EtherCat®-based industrial precision motion controllers are some of the technologies featured in this catalog. 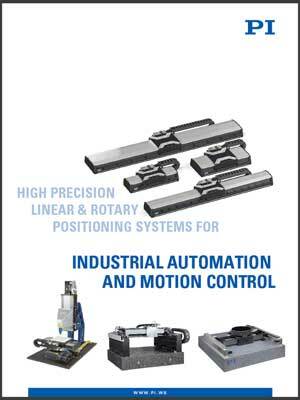 New High Precision Industrial Automation & Motion Control Systems Catalog. PI’s proprietary technological know-how and vertically integrated production are the basis for the successful development of customized motion systems from scratch. All technologies can be adapted specifically to an application. Examples include PIMag® high speed voice coil drives for integration into an OEM motion systems, as well as complex multi-axis positioning setups, and fully integrated, automation sub-systems. Additional precision motion products not covered in this catalog are miniature stages, piezo motors and mechanisms, piezo-flexure nanopositioning devices, silicon photonics automation systems, ultra-fast laser beam steering systems and sub-nanometer precise position sensors.